Vucevic had 19 points, 17 rebounds and five assists. ... Fournier added 18 points. ... Orlando shot 10 of 35 on 3-pointers. 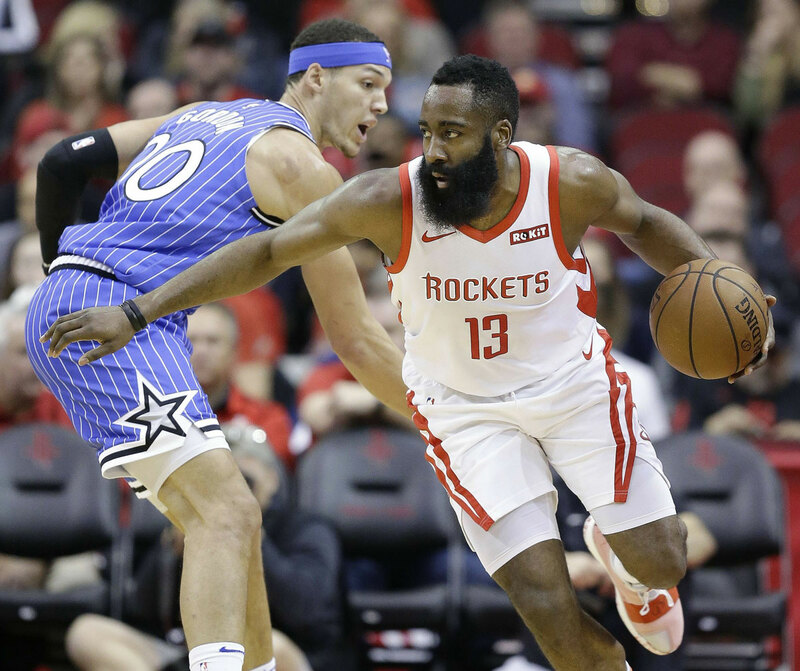 James Harden had another huge offensive game Sunday night, scoring 40 points in Houston’s comeback win over the Orlando Magic. But it was the point guard’s defense that coach Mike D’Antoni raved about after Harden blocked three shots and helped limit Orlando 7-footer Nikola Vucevic to just two points in the second half. Harden didn’t answer when asked what he thought about D’Antoni calling him a “point-center” but he did smile and he was still laughing as he walked off following the question. Harden’s 40 points included five critical ones down the stretch to lead the Rockets to a 103-98 victory. The reigning MVP extended his streak of 30-point games to 23, which ranks fourth in NBA history behind three such streaks by Wilt Chamberlain. Harden, who had 11 rebounds and six assists, has scored 40 or more points in 12 of his last 17 games, including a franchise-record 61 against the Knicks last week. Houston trailed by as many as 16 and never led until there were about four minutes remaining. The game was tied with about 75 seconds left when a 3-pointer by Harden put the Rockets up 98-95. Terrence Ross missed a 3 on the other end and Harden added a step-back jumper with 30 seconds left to stretch the lead. Harden got his third block when he swatted away a shot by Fournier, and Chris Paul added two free throws with 13.6 seconds remaining to secure Houston’s third straight victory. Paul had 12 points and six assists after missing the previous 17 games with a strained left hamstring. The Rockets went 12-5 in Paul’s absence and he said his return doesn’t change much for Harden. Harden was glad to have Paul back. Aaron Gordon had 23 points to lead the Magic, who have dropped six of seven. The Rockets got another strong game from Kenneth Faried, signed last week to fill in while Clint Capela recovers from thumb surgery. Faried finished with 12 points, 10 rebounds, five assists and two steals. Harden scored 38 points in a 116-109 loss to the Magic this month despite going 1 for 17 from 3-point range. He fared better on Sunday, making four of 12 attempts on a night when Houston hit 12 of 36 tries. Orlando had an eight-point lead before Houston used an 11-3 spurt to tie it at 87 with seven minutes left. Paul drained two 3-pointers during that stretch and Gerald Green added a third. Ross made a 3 for Orlando to power a 5-2 mini-run that put the Magic back on top 92-89 with five minutes left. But then Houston scored the next four points, capped by a layup from P.J. Tucker, to make it 93-92 and give the Rockets their first lead of the game about a minute later. The Magic led by seven at halftime and had pushed it to 76-61 midway through the third quarter after scoring nine straight points, five by Aaron Gordon. Eric Gordon made a 3 for Houston’s first points in almost four minutes after that, starting an 11-4 run that cut the lead to 80-72 with about a minute left in the quarter. Aaron Gordon added a basket for Orlando and Paul hit one for Houston to leave the Magic up by eight entering the fourth. Magic: Vucevic had 19 points, 17 rebounds and five assists. … Fournier added 18 points. … Orlando shot 10 of 35 on 3-pointers. Rockets: Faried has scored 10 points or more in each of his four games with the team. … D’Antoni said before the game Brandon Knight was available after missing the previous seven games with a sore left knee, but he did not play. Harden has scored 40 or more points 18 times this season to make him the first player since Michael Jordan (22) in 1986-87 to have at least 18 40-point games within the first 46 games of a season. Magic: Host the Oklahoma City Thunder on Tuesday night. Rockets: Host the New Orleans Pelicans on Tuesday night.